To commemorate the first anniversary of the Sandy Hook Elementary School shootings, Bullis Charter School teacher Jessica Lura developed a lesson for students to enable discussion of the tragedy. Lura serves on the board of teachers for UClass.org, a website that specializes in sharing Common Core lesson plans across the Internet. Because she has taught first- through eighth-graders, UClass leaders asked her to design a lesson appropriate for a range of age groups. “It is such a difficult subject to talk about because it is a balance between wanting to honor what happened without freaking out the students,” Lura said. The lesson, intended for fourth-graders and up, addresses the Dec. 14, 2012, shooting at Sandy Hook in Newton, Conn., which left 20 children and six adults dead. The lesson includes a short film clip of former U.S. Rep. Gabrielle Giffords (D-Ariz.) addressing Congress on gun violence. Then the conversation shifts to what students can do. After investigating other responses to the Sandy Hook shootings, Lura introduced Hands of Hope for Sandy Hook, a project that includes students making hand-shaped cutouts with their hopes for the future regarding the control of violence in the U.S. written on them. “The hands are a visual symbol that says (to the victims of the tragedy), ‘We are with you, we sympathize and we are going to do something to change it,’” Lura said. Each student wrote what was most important to him or her, such as: “I hope for a safer future.” “I hope people who are mentally ill receive the help they need.” “I hope for stricter gun laws.” “I hope for a safer United States,” etc. An extension for older students includes looking at ways students can effect change regarding violence locally. 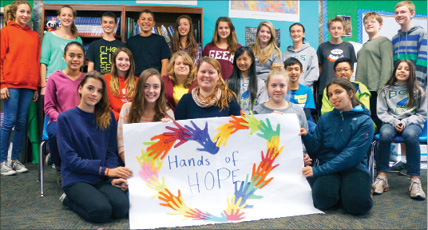 Bullis Charter School fourth- through eighth-graders participated in creating Hands of Hope, which has spread across the U.S. The goal was to get at least 5,000 Hands of Hope created by the recent anniversary of the tragedy. Nicole Hockley, mother of Dylan, a kindergartner who died at Sandy Hook last year, has viewed the messages students submitted through the UClass website. Giffords, a victim of gun violence herself, also has viewed the students’ messages. To view the full lesson, visit uclass.org/handsofhope.